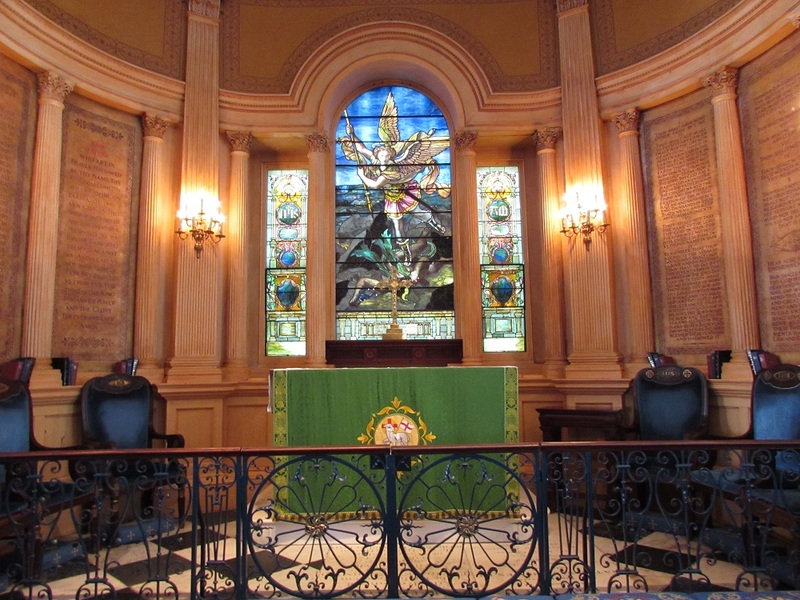 George Washington had attended services at St. Michael’s Episcopal Church in Charleston during his Southern Tour in 1791. I needed to check it off my stalking list so yes, we wanted to tour the church. Well actually, I just wanted to see the church. Taking the tour was a necessary evil, since they weren’t going to let me wander through on my own. The guide had us wait while he tried to corral others into the tour. “Do you want a free tour?” he’d ask every person who walked past. They’d look startled, mumble “no” and scurry away. I began to feel a little uncomfortable. Why so desperate to get people into the church? It was, as with the Dock Street Theatre, nothing more sinister than an enthusiastic volunteer trying to drum up some business. This one was a church member. He tried for another 10 minutes, but when he failed to convince anyone else that he wasn’t trying to lure them into the church for nefarious purposes, he proceeded with just us. St. Michael’s occupies the oldest church building in Charleston (St. Philip’s Episcopal, with the brown steeple in the photo above, is the oldest congregation. The current building is the third iteration, built in 1825. The white steeple is St. Michael’s). Its cornerstone was laid in 1752 and the first service held in 1761. The architect is unknown but it’s in the Georgian style common to many colonial era churches. 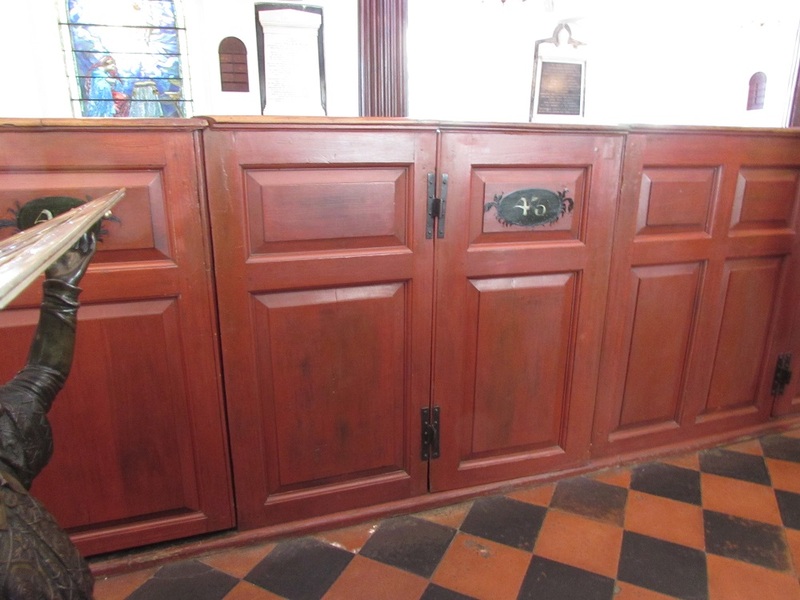 Pew #43, known as “the Governor’s Pew,” was the one that George Washington sat in when he attended services on the afternoon of Sunday, May 8, 1791 (he’d attended services at St. Paul’s in the morning). Seventy years later, Robert E. Lee would occupy the same pew. “Robert E. Lee was against slavery, you know,” the guide told us. Well, what I know is this: Lee wrote in a letter that, “There are few, I believe, in this enlightened age, who will not acknowledge that slavery as an institution is a moral and political evil.” But — and huge BUT — he went on to write, in the same letter, ” The blacks are immeasurably better off here than in Africa, morally, physically, and socially. The painful discipline they are undergoing is necessary for their further instruction as a race, and will prepare them, I hope, for better things.” His father-in-law’s will asked that his slaves be freed upon his death, or by 5 years after his death at the latest. Lee kept them the maximum five years before he freed them. So while he may have believed that the institution of slavery was morally wrong, he didn’t seem to object to its practice. 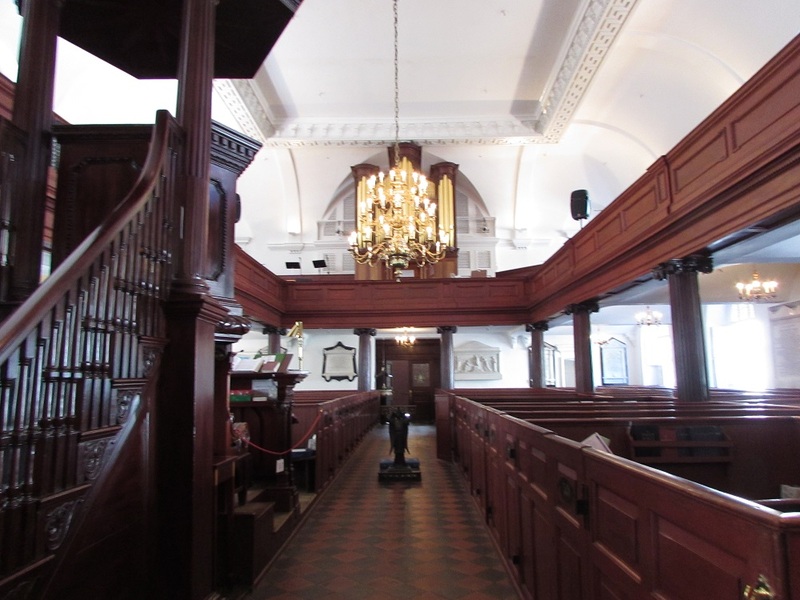 The pews are made of cedar, and while they are no longer available to be rented by specific families, some parishioners continue to occupy the pews that have belonged to their families for generations. The circa 1803 London-made chandelier has gone from candles to gas to electricity. The window is 1905 Tiffany. It’s St. Michael slaying a dragon. I don’t care that, in Revelations, the St. Michael story uses the dragon as a metaphor for Satan. I always root for the dragon. After the church, the guide took us outside to see the cemetery. 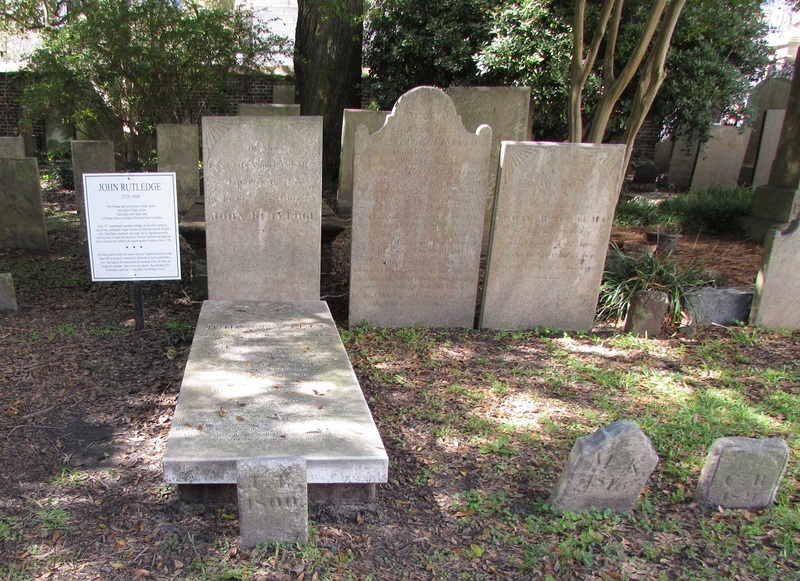 It — like the church itself — serves Charleston’s upper crust and several history-makers are buried there. This includes John Rutledge, a founding father and all-around interesting Rev War era character. His younger brother, Edward Rutledge, was the youngest signer of the Declaration of Independence and the most charasmatic among the characters in the musical “1776.” He gets to sing the best song: Molasses to Rum. That’s where the title of this post comes from: Who sails the ships out of Guinea, laden with bibles and slaves? He’s buried at St. Philips. “Can I pray for you?” asked the guide as he wrapped up the tour. That was a first. I’ve been through dozens of church tours and no one has ever offered to pray for me. It seemed a rather evangelical move for an Episcopalian but sure, why not. He prayed that we’d have a safe journey. To which we added our fervent amens. 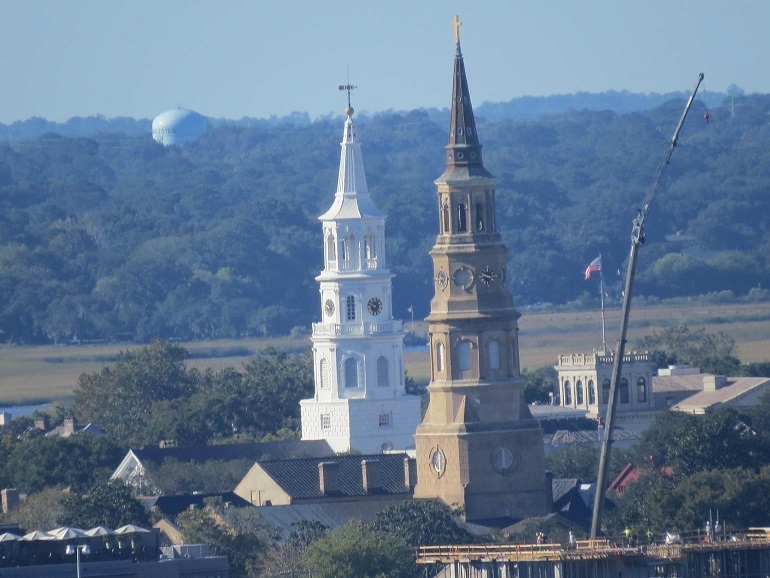 Gallery | This entry was posted in South Carolina and tagged George Washington in Charleston, historic Charleston church, Robert E. Lee in Charleston, St. Michael's Episcopal Church. Bookmark the permalink. I’d never come across them before in Charleston either. But since I’d seen most of the “regular” museums on previous trips, we skipped those on this trip and just went into whatever looked interesting. And it just happened that there were lots of beautiful buildings open to the public for free. And several of them had volunteer guides that gave tours, also for free. That makes me think that maybe I’ll pull together a list of History Tourist free sites. Thanks for the inspiration. Actually, that’s a really great idea! I might just do that too! That dragon does get a raw deal in all the St George stories! George is our patron saint so we are obliged to side with him. Does the USA have a patron saint? The Roman Catholic patron saint of the United States is St. Mary of the Immaculate Conception. Not sure if the Anglicans go with the same one. Going straight to the very top then? Christ Church in Alexandria, Virginia, did not force a tour on my family but simply, and graciously, invited us to enter via a side door and take our time to browse, pray, meditate. Even to take pictures. That was a lovely, memorable experience for us! I love Christ Church — so beautiful. And I love the rest of Alexandria too.